The traditional pathway of becoming an interventional radiologist involved first completing an intern year in surgery, internal medicine, or a transitional year followed by completing a 4 year residency in diagnostic radiology. Once a resident completed 4 years of diagnostic radiology, they applied to an additional year of interventional radiology fellowship. Although this pathway remains in existence today, this model has lost favor in the interventional radiology world as it is seen as sub-specialty training in IR condensed into only one year. The phasing-out of this traditional pathway and the emergence of new, hybrid pathways will allow new trainees to work on procedural and medical skills throughout their years of residency and will allow for continued IR education and a more well-rounded provider who is better prepared for practice. 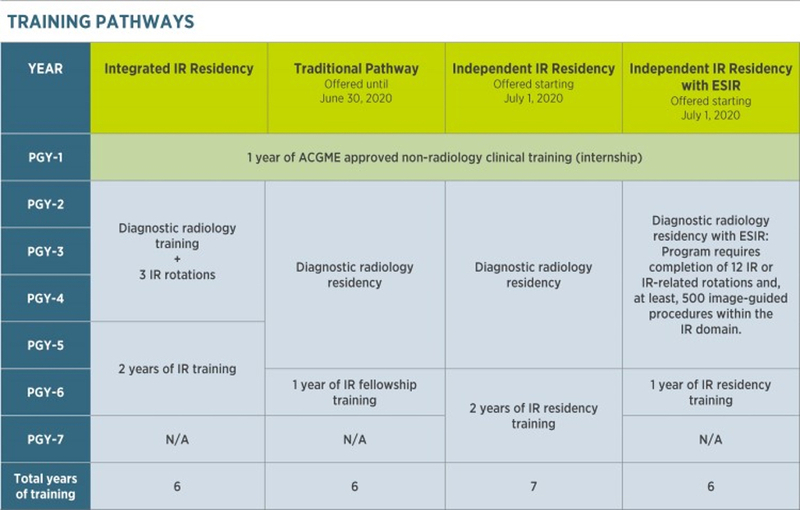 Interventional radiology has reached a crossroads, where the traditional pathway (diagnostic radiology residency followed by IR fellowship) will cease to exist by June 30, 2020, and three new separate pathways have emerged. The new IR pathways will incorporate inpatient consultations, admitting patients in independent IR service, and having involvement in outpatient clinic with longitudinal follow-up. This is the new integrated IR residency and consists of an intern year, 3 dedicated diagnostic radiology years (with IR rotations each year), followed by two years of focused interventional radiology and clinical training (hepatology, vascular surgery, intensive care and oncology rotations, among others). A majority of integrated-interventional radiology programs, also known as the IR-DR pathway, were ACGME-approved in 2017. Trainees will complete their training as board certified IR and DR physicians and won’t have to undergo additional fellowship training. This pathway has emerged as one of the most popular and competitive residencies in the last several years. As of February 2018, there are 75 ACGME approved IR/DR programs with 35 categorical positions (starting at the PGY-1 level) and 98 advanced positions (starting at the PGY-2 level) which have all filled in the 2018 match. Early Specialization in Interventional Radiology (ESIR) pathway is an alternative pathway in obtaining training in IR. This pathway involves completing a one year internship followed by matching into and completing a diagnostic radiology residency program with an ACGME-approved ESIR pathway. Throughout training, the resident needs to complete a total of 12 IR or IR related rotations and, at least, 500 procedures. Most of this training usually happens during the last year of diagnostic training (PGY-5). These residents will then have to apply to the new independent IR residency (previously known as fellowship) and subsequently have to match into and complete an additional one year of IR training (instead of 2, if not having undergone ESIR training). The third and final pathway is similar to the traditional pathway, allowing residents to match into and complete a diagnostic radiology residency without an approved ESIR pathway, followed by having to match into and completing two years of independent interventional radiology residency. This independent pathway will essentially replace the current IR fellowship. It is expected that the majority of interventional radiology fellowship programs will also have an independent IR residency.